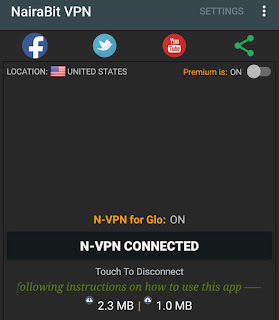 Hi everyone, I'm glad to announce the latest N-VPN for Latest Glo Free Browsing Cheat. 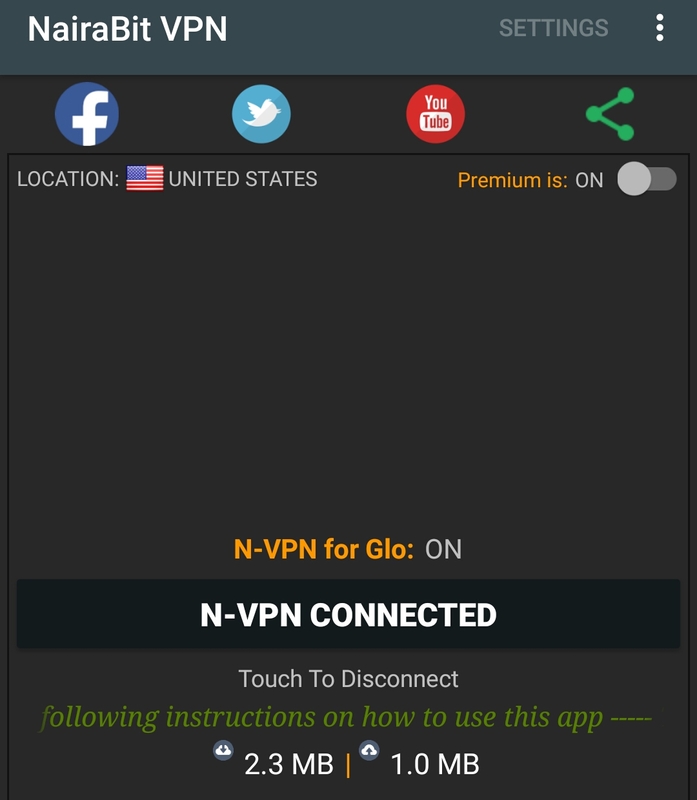 This Glo VPN cheat app is the official free browsing app of Nairabit and this latest 2018 version works with any free URL but it was specially moded for Glo Cheat to access free internet. If you are having issues with your glo data, read this post below otherwise continue reading. The First Nairabit apps (N-VPN for Airtel free Browsing cheat, glo free browsing cheat, MTN free browsing cheat and 9mobile (Etisalat) free browsing cheat) were created to be a one Tap VPN for easy usability but all has been blocked until recently when glo started working. This Glo free browsing cheat is for android phones only, glo cheat for PC and Modem will be posted. No need for any free browsing setting because it comes preloaded with the necessary setting, just follow this simple "5 simple taps" and you should start browsing for free with unlimited data. ✓Connects in less that 5 seconds. ✓ it's absolutely free with updated premium United States, Germany and Netherlands Servers. Note: it is advisable to use glo 3G SIM because I founf out that most 4G SIMS don't work or has trouble getting a stable connection. Wait a few seconds for the app connect, once connected, minimize and start enjoying latest Glo free browsing cheat. If the app prompt you to give it permission, just tap ok.